The heap size is set to 1GB. How do I increase that to 2GB? Can I add the OSATE2 project setup to that an existing workspace? I want to use the eclipse installation with a new workspace? How do I add a feature to my eclipse installation and share it with others in my team? I have installed a feature in my eclipse installation, but it’s not available when I start OSATE using a launch configuration. How can I add a feature to the OSATE2 development setup? Where can I find documentation about Oomph setups? 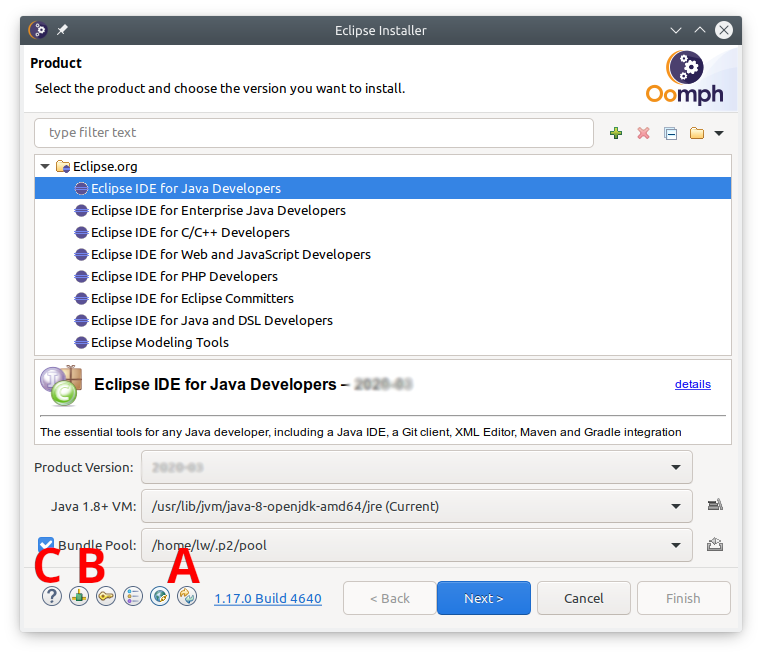 Starting with OSATE 2.3, which is based on Eclipse 4.7.1 (Oxygen.1), the recommended way to set up a development environment uses the Eclipse Installer. 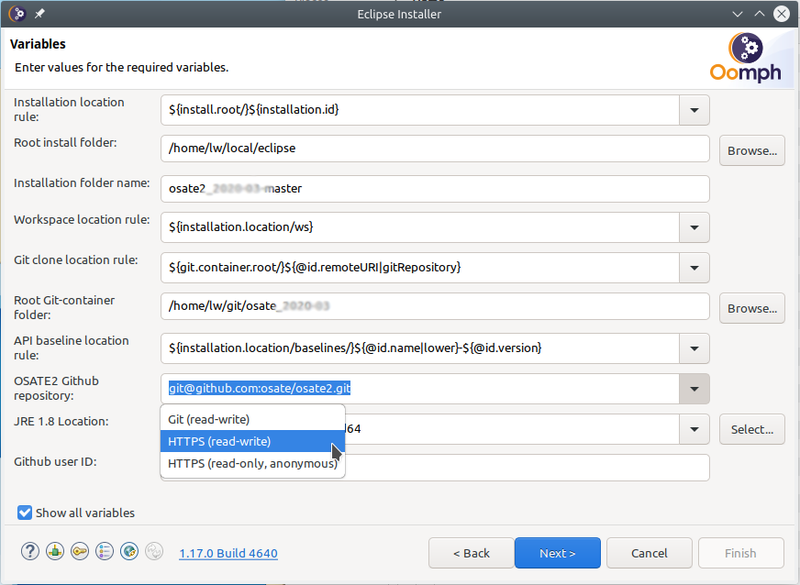 The Eclipse Installer can be downloaded from the eclipse Web site. Follow this link to download the installer for your platform. Make sure that the word size of the installer version matches the word size of your Java installation. For example, if you are running 32bit Java on a 64bit Windows you must use the 32bit installer. On Mac OSX and Linux the installer is a compressed archive. Extract it to a directory of your choice. The installer for Windows is a self-extracting archive. When running the executable you can choose to keep the extracted installer and select an installation directory. Note: On Windows the initial extraction is into a temporary directory, usually into a temporary directory in C:\User\Joe\AppData\Local\Temp. The name of the temporary directory starts with the letters eoi. If your computer is subject to a restrictive security policy that does not allow execution of arbitrary programs from that directory you should copy the directory content to another place from where the installer can be executed. If necessary, configure proxy settings, and optionally enter ssh credentials (B). User the help (C) for more detailed information on these steps. Select Eclipse Modeling Tools as the base product to install, and select 2019-03 as the product version. Choose 64bit as your Java version. Add a user project by clicking on the + icon (A). Check the box next to the added OSATE2 Development entry in the tree under Github Projects/. Then select the master stream in right column of the table at the bottom. Check Show all variables near the bottom of the dialog. Without this only variables that do not have a value will be displayed. Oomph stores variable values between invocations, so nothing would be shown after the first run. The first group of variables determines the directory for the new eclipse installation. You can choose between (a) a root directory and a subdirectory within that root directory and (b) a full path to the installation directory. The next group determines the location of the workspace. Do not reuse an existing workspace as that will likely lead to problems. The git clone location is the root directory into which all git repositories are cloned. The tycho build requires that all git repositories share the same root directory. If you have (all or some) repositories cloned already you can re-use the clones. Make sure that all clones have the develop branch checked out (except osate2-ocarina, which has just a master branch). Also, make sure that they are up to date by issuing a git pull command. Finally, choose how to access the git repositories. The default choice uses ssh access and requires ssh credentials (click the key icon at the bottom to set this up), and your public key must be uploaded to github. The HTTPS (read-write) option uses your Github username and password. When you choose https a variable for the user name will show up. Replace the default anonymous with your github user name. The next screen shows the installation steps that will be executed. Click Finish to download eclipse and install it to the selected location. When run for the first time, it will download features and plugins into the bundle pool. The bundle pool is shared among eclipse installations such that subsequent installations are much faster. Upon first start eclipse executes additional setup tasks to set preferences, clone git repositories if needed, import projects, and organize projects into working sets. The Java perspective is set as the default and eclipse is configured to start with this perspective. The default file encoding is set to UTF-8. A source cleanup profile Osate is created and enabled for the workspace. Java formatter profiles Osate and SMACCM. Profile Osate is enabled for the workspace. Java code cleanup on save are configured and enabled for the workspace. An Xtend formatter profile Osate is created and enabled for the workspace. Cloning the git repositories takes some time. Progress can be viewed in a dialog. To show the progress dialog, click on the animated icon the eclipse status bar. Please report issues with the setup using the osate2 issue tracker on Github. You can also edit the installation setup to establish a maximum heap size just for this eclipse installation. You can also use the import to add additional project setups to a workspace. No problem. Switch to the new workspace location and import the OSATE2 project setup. Alternatively, you can create a new eclipse installation for each new workspace workspace. 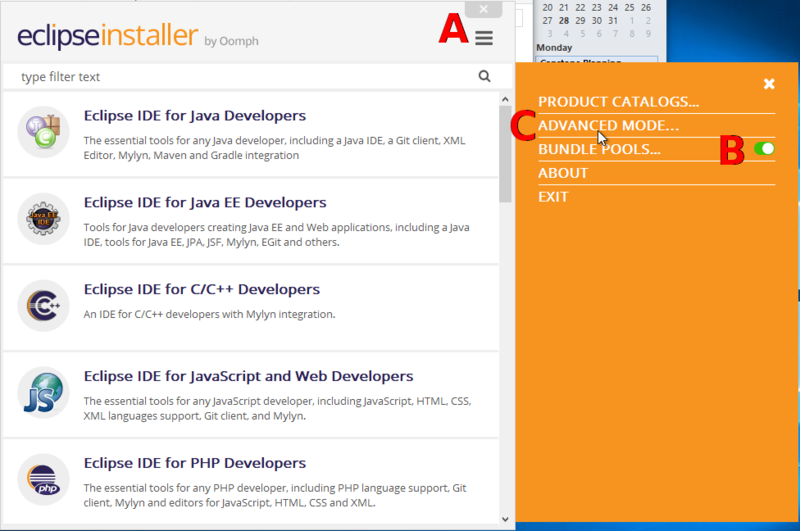 When using a bundle pool, an eclipse installation is comparatively lightweight, and quick to set up. 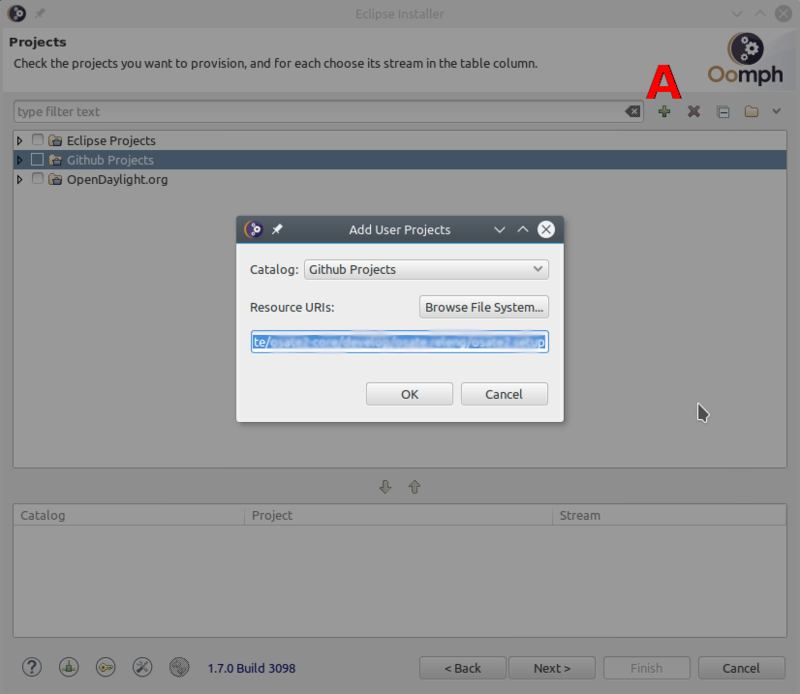 Create your own setup file and import it into eclipse. P2 Director tasks install features in eclipse. It is recommended to put setup files under version control. Installed features must be part of the target platform to be available to a runtime workbench. The OSATE2 setup uses a target platform Modular Target. To add to this target create a Targlet in your setup. See osate2.setup for an example. Edit the OSATE2 setup (add a P2 director task and/or a targlet) and submit a pull request. DO NOT push a modified osate2.setup file to the develop branch on github! This tends to happen on Windows when the Java version is updated. Oracle’s installer removes the old version and installs the new version into a new directory. Go back in the Oomph dialog to the variables page and change the JRE 1.8 Location variable to the new location.